●What are the storage and operating temperatures for On-lap? 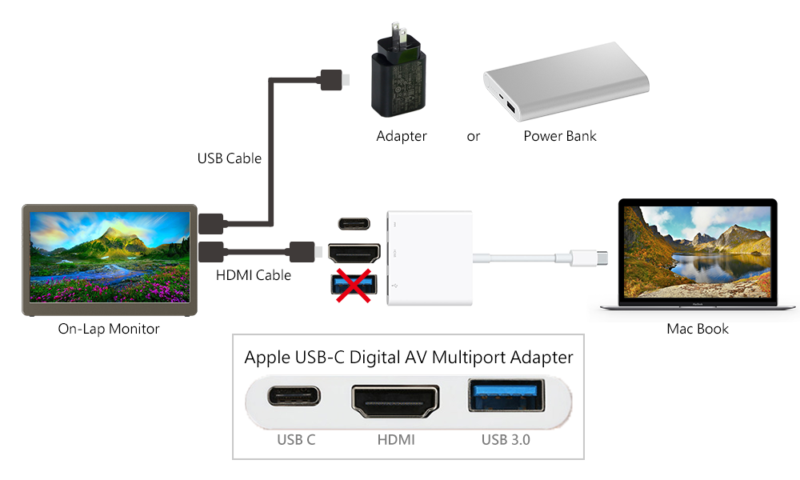 ●I use Apple USB-C Digital AV Multiport Adapter to connect my Macbook and On-Lap monitor but the monitor doesn’t work and just turn on and off repeatedly. 1. Use GeChic USB cable to power On-Lap monitor by connecting to 5V-2A charger or power bank. 2. Connect On-Lap monitor to Macbook with the Micro HDMI to HDMI-A video cable. ※The USB-A (female) port on Apple USB-C Digital AV Multiport Adapter cannot supply enough power to On-Lap monitor, monitor won’t turn on without sufficient power. ●I would like to use one PC to run multiple screens with a HDMI splitter. Is that possible? If your HDMI splitter can output 1080P 60Hz video signals stably, you can use the splitter to connect multiple On-Lap screens at the same time. Please power each of your On-Lap monitor by using 5V2A adapter instead of USB hub. Some HDMI splitters do not provide enough signal strength, which may cause On-Lap monitor does not display images, or screen images are interrupted. Hence, please be noted HDMI splitter and HDMI cable should output enough and stable HDMI signal strength. ●Which On-Lap monitors support PS4 / Xbox One? All of On-Lap monitors support PS4/ Xbox One. ●After connecting to PS4, the monitor only displays background music without the characters' voices. Except dual channels, all of the PS4 games' sound effects have third bass vocal channel. Since the audio output of our monitor only supports "two channel," please make sure the audio settings of PS4 is set as two channels.